The birds are chirping, the soil is moist and the wind socks all point to spring on the farm this week. Not sure if we are past all the winter storms yet, but according to Nolan Doskin, the state climatologist, a strong El Nino year often produces "normal" seasons for our area. I suppose normal is up to interpretation here, but it is time to move forward on the spring projects until mother nature tells us different. 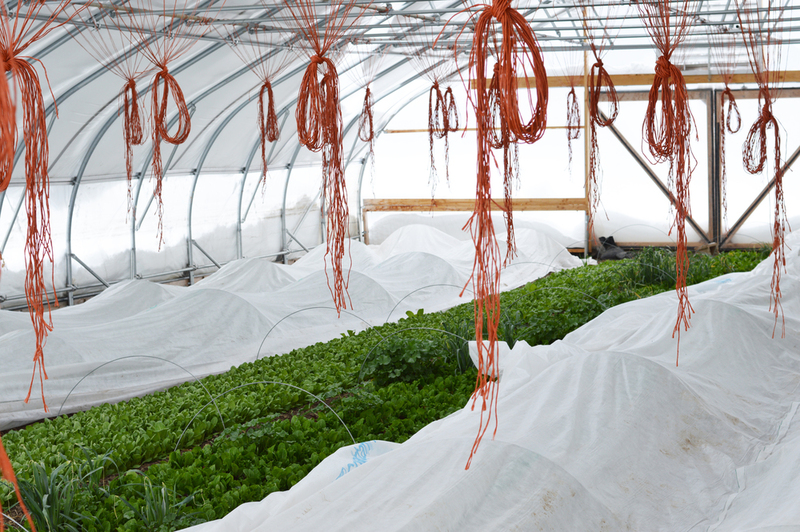 There are thousands of seedlings to start, compost to spread, soil to work, and greens galore to get out of the tunnels before we start prepping them for warm weather crops. As we head into the last month of CSA, the boxes will be getting lighter! Not necessarily because we won't have as much food, but the food is just changing. We design the boxes based on storage-ability of certain crops and our ability to grow greens during certain times of the year. The fall and early winter are dedicated to squash, cabbage, onions, and garlic as those items do not store as well over time. We try to hold off on things like kohlrabi until it gets closer to spring because those are the foods that store extremely well and had gotten our ancestors through the "hunger moon" of April. Lucky for us, we have tunnels that will help us from getting board on the home stretch of the winter to spring transition and there are still lots of delicious things to eat right now. Spring is the time that I really start to incorporate dry beans, dried fruit, and nutrient dense grains in with my root veggies and greens. There are almost a million ways to do this and most of them start with roasting, steaming, or sauteing those roots. This week we caught up on our carrot consumption with a healthy quinoa salad with carrots, raisins, and spinach. Root vegetable hash is a great way to use a multitude of roots in the morning (or for dinner!). Skillet hash is easy on the stove and pairs well with a poached egg, something else that is abundant this time of year!